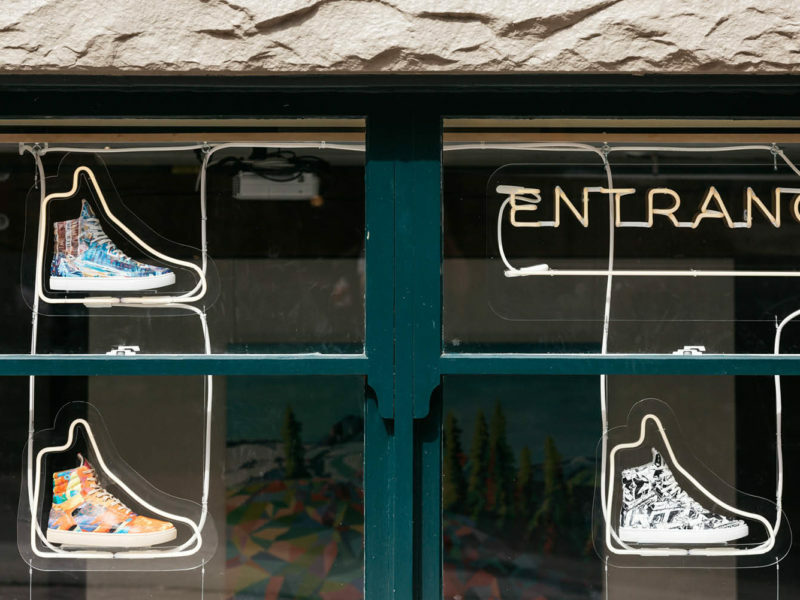 Six Hundred Four sneaker gallery in Vancouver’s Gastown neighbourhood, which prints the handiwork of local artists onto sneakers (photo: Brook James). If you asked me a couple years ago what appealed to me about Vancouver, I would’ve replied with hopeful fantasies of weekends spent hiking through dewy cedar forests, of casual snowboard rides after work during winter, and of swimming in pristine, pine-fringed lakes during summer. While these musings were by no means a misguided representation of the city, they all involved leaving it. When I finally arrived in the thick of Downtown Vancouver, amid an urban flurry of bag-flapping shoppers and mega malls, and high rises mirroring one another, I could not get out of the city centre and into the outdoors fast enough. This was not the Canadian wilderness wonderland I had imagined. Since those early expat days, stunned by both the scale of Downtown’s towers and the snow-covered slopes that loom behind them, my appreciation for Vancouver has extended far beyond mere proximity to what’s outside of it. Just like the local landscape, Vancouver’s inner city is a place of contrasts, with multi-million dollar condos alongside thrift stores, fine dining institutions as popular as the scores of food trucks, and holistic fitness centres on the same street as cannabis dispensaries. Just as diverse are the regions of Vancouver in which these contrasts reside. Surrounding Downtown you’ll find dozens of inner city neighbourhoods, each with a niche appeal. From Gastown’s gritty congregation of micro bars and design boutiques to Kitsilano’s laidback beach locale, give the city a chance and you’ll some of Vancouver’s best experiences tucked away in and around the shiniest tourist haunts. Just east of Downtown’s dramatic waterfront is lively Gastown, characterised by its cobblestone roads, curling streetlights and Victorian buildings — one of few areas you’ll find heritage architecture in the city. But beyond its famous whistling steam clock and the string of souvenir shops along Water Street, Gastown is the epicenter of Vancouver’s culinary scene. While most diners frequent favourites such as Tacofino (Mexican fare with a Pacific Coast twist), Bao Down (street food-inspired Asian fusion), or MeeT (vegetarian comfort food), there are a slew of blink-and-you’ll-miss-it gems in the area. Seating barely two dozen, what The Sardine Can lacks in size it makes up for in flavour with Spanish tapas and an all-Spanish drinks list. Try the octopus terrine with a sherry. Similarly cosy, Gringo bar, tucked away down Blood Alley, serve $3 tacos, locally brewed beer and 90s themed decor. 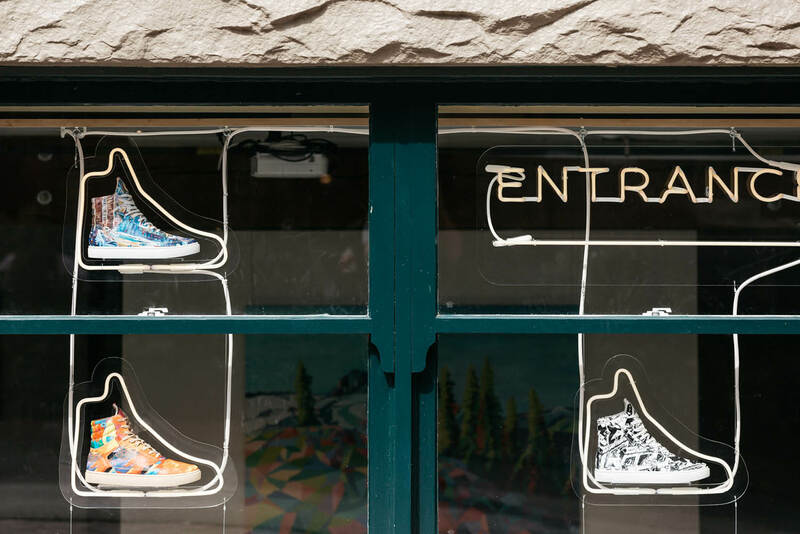 As your food settles, scope out the multitude of nearby boutiques and design houses such as Six Hundred Four sneaker gallery, which prints the handiwork of local artists onto sneakers. Or if it’s late, venture downstairs to Guilt & Co. basement bar, which is always dependable for live music and cocktails. Wedged snuggly south of Gastown is one of Vancouver’s oldest, but perhaps most underrated neighbourhoods, Chinatown. A hotbed of markets and Chinese medicine shops, this is the third-largest Chinatown in North America. Best known for the Dr. Sun Yat-Sen Classical Chinese Garden and the iconic Millennium Gate, Chinatown is one of the city’s up-and-coming areas for cool boutiques and hot restaurants. Among them is Kissa Tanto, serving Italian-Japanese fusion fare in a space inspired by the Tokyo jazz cafes of the 1960s. Unsure about the unconventional flavour marriage? Never fear. Kissa Tanto was named this year’s best new restaurant as part of Canada’s 100 Best awards. Fellow newcomer Bao Bei Chinese Brasserie is as skilled in delivering hearty flavor sensations as it is in attracting the who’s who of local celebrities. Just down the road, The Keefer Bar has been internationally recognised for its Chinese apothecary-influenced cocktails. Or get to know the locals at Harvest Community Foods — a grocery shop that began as a community project, created after a public vote determined how the site should be developed. Here you’ll find great ramen and homemade Kombucha. Further south over Cambie Bridge is the fittingly named Mount Pleasant. Once a working-class area, the neighbourhood is becoming increasingly gentrified and popular with young professionals and families. While the more distinctive local landmarks are City Hall, with its Art Deco features, and the globe-like Science World structure (check out the adults-only After Dark events here), you can easily spend a whole day perusing the rest of Mount Pleasant. The unofficial heart of the ‘hood is Main Street, known for its formidable lineup of restaurants, coffee shops, bars, book shops and antique stores, akin to Sydney’s King Street in Newtown. Check out Kafka’s Coffee & Tea for a caffeine hit before exploring the superb array of vintage clothing at Eugene Choo, the handcrafted shoe collection at Umeboshi, or the collection at Vancouver’s most adorable stationery store, Regional Assembly of Text. You’ll also find some of Vancouver’s most renowned craft breweries around Main Street, so don’t leave without picking up a growler from 33 Acres (you can’t go wrong with 33 Acres of Sunshine) or beloved Brassneck Brewery. After dark, slip into The Narrow Lounge — a hidden dive bar marked merely by a red light beside a furniture store, or try Fox Cabaret, a mainstay for musical entertainment. If you’re visiting in summer, don’t miss the Vancouver Mural Festival, which celebrates Mount Pleasant’s vibrant young art scene with large-scale frescos (that you can enjoy anytime of year), street parties and gigs. Venturing west from Mount Pleasant is the laidback beach haven of Kitsilano, better known as Kits. Like a low-key hybrid of Sydney’s Eastern Suburbs and San Francisco’s bohemian Haight Ashbury, Kits now combines its 1960s hippy roots with a thriving yoga community, and a bourgeoning food scene along the main thoroughfares (West 4th Avenue and Broadway). The Naam is a local favourite, serving hearty vegetarian 24 hours a day, as is Sophie’s Cosmic Cafe, while higher-end establishments like Fable are quickly gaining a cult following. But perhaps the most defining element of Kits is its sandy beaches and picturesque seawall walkway, teeming with buskers, yogis, volleyballers and rollerbladers throughout summer. Beachgoers are also treated to some of the most iconic Vancouver vistas, with the ocean contrasted by the distant Downtown skyline and towering peaks beyond, which are all illuminated in pastel hues during a classic West Coast sunset. Follow the seawall all the way to Granville Island, one of Vancouver’s most popular tourist haunts, and you’ll pass quaint fish and chip shop, Go Fish, tucked away by the Civic Marina docks. Going in the opposite direction, catch one the many buses that regularly traverse west from Kits to the University of British Columbia (UBC). The world-renowned campus is home to the extraordinary Museum of Anthropology, as well as the city’s only natural history museum, the Beaty Biodiversity Museum. Here you’ll also find Wreck Beach, loved for its stunning surrounds and nudist-friendly rules. Visit on a Sunday to see the drum circle spectacle at sunset, with booming bongo drums, blazing bonfires and carefree dancers.